Who says kids won’t eat their veggies? That’s simply not true! I have a super simple, easy weeknight meal to share with you that is perfect for the family and special enough for date night! Actually I have my niece Chloe visiting this week (she’s my special guest star on Facebook LIVE tomorrow!) and I made this for dinner last night. Couple reasons why I like this meal. Don’t have the veggies the recipe calls for? Use what you have! 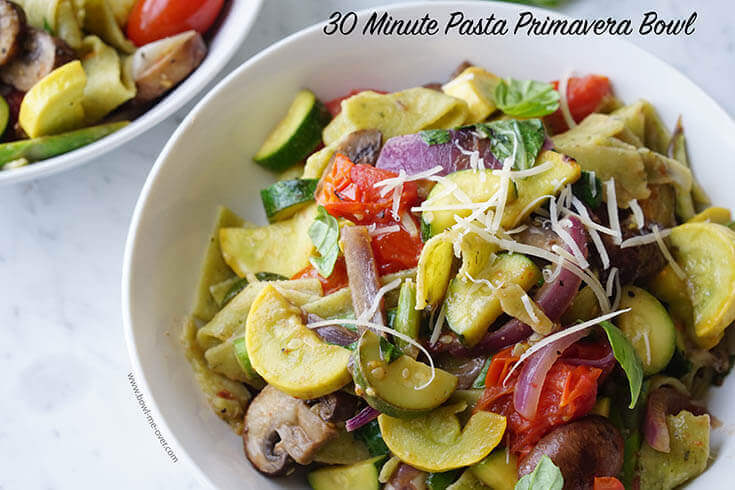 30 minutes to make this super easy delicious pasta! 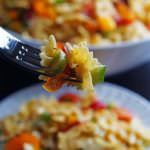 Pasta Primavera – it’s an Italian classic and my version is light and flavorful without all the heavy cream but with all the delicious flavor! I have a couple other super popular pasta meals on the blog, so if you like the sound of my Pasta Primavera Recipe be sure to hop over to the blog for my Creamy Lemon Pasta – it is amazing and also a 30 minute meal! Ok, but I don’t want to get too far ahead of myself! Let me show you how easy this meal is to make! Start by prepping the vegetables. First we’ll start with the veggies – these are the great summer vegetables you’ll find at the Farmer’s Market right now. 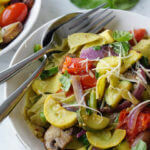 Asparagus, zucchini, yellow squash, mushrooms and onions. Prepare them by cleaning and slicing them into bite sized pieces and set them aside. No red onions? Use yellow or white. No squash? An eggplant will work. What if you don’t have basil? A couple scoops from a jar of pesto will totally do the trick! Put on a big pot of water on to boil for the pasta and when you’re ready to drop the pasta into the water, it’s time to cook the veggies and make your sauce. Ok – pasta is in right? So now you’ll heat up a large skillet pan over medium high heat. When hot, add butter & olive oil and when it’s bubbly toss in the mushrooms and onions. Next add the zucchini, yellow squash, asparagus and tomatoes. Season with salt, pepper and red pepper flakes. Cook until softened about 3 minutes. The sauce for the Primavera is made right in the skillet. Then you’ll make the sauce right in the pan adding garlic, chicken stock and white wine. When the pasta is done, drain it (reserve a cup of the cooking liquid) and add it right to the skillet along with Parmesan cheese and mix everything together well. Serve it up, topped with torn basil leaves and a sprinkling of parmesan! Mmm… Delicious. Easy. Done! Serve with some crusty bread and a salad, it’s an easy meal and takes less than 30 minutes to make! 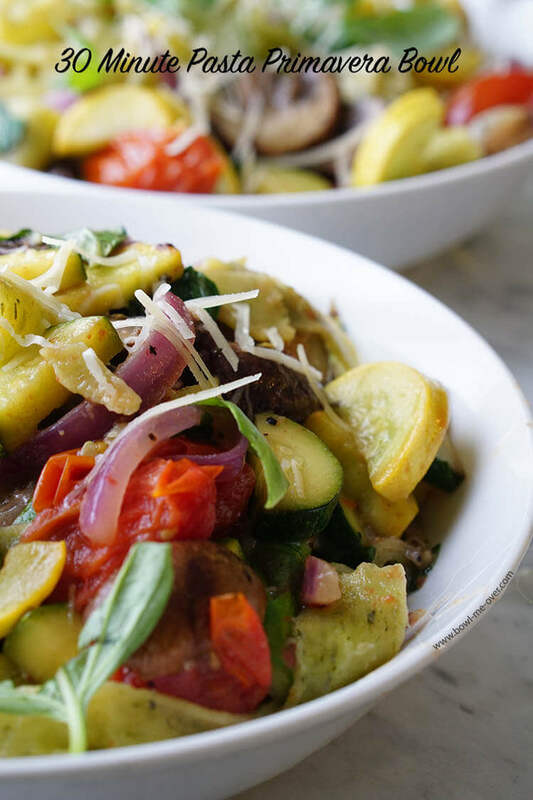 This makes four generous bowls of Pasta Primavera! Want to mix it up a bit? Add some leftover rotisserie chicken at the end or shelled, deveined shrimp – just cook them thru until they are pink and no longer opaque. Making me hungry for pasta just thinking about this meal, enjoy!!! Oh, before I forget here’s another super popular pasta I have on the blog. Grab your fork because you’re going to love this one! And a few more delicious pasta meals to try! 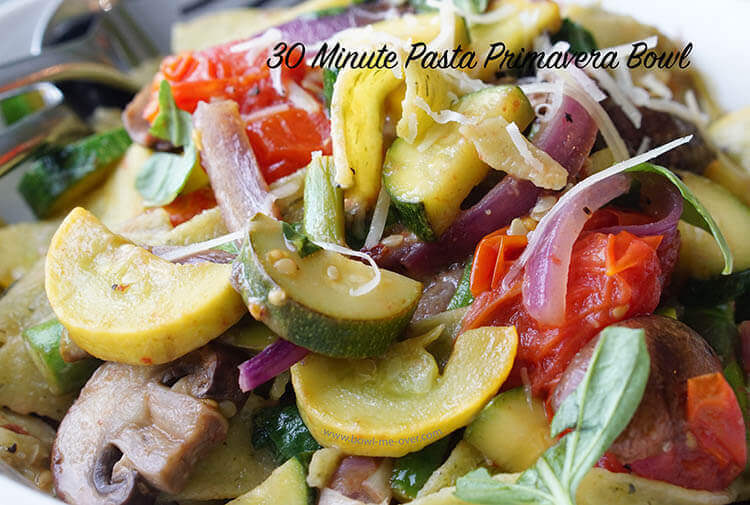 Light and delicious this Pasta Primavera is perfect for an easy weeknight meal because it takes only 30 minutes to make. Or lovely for date night with a great bottle of wine! 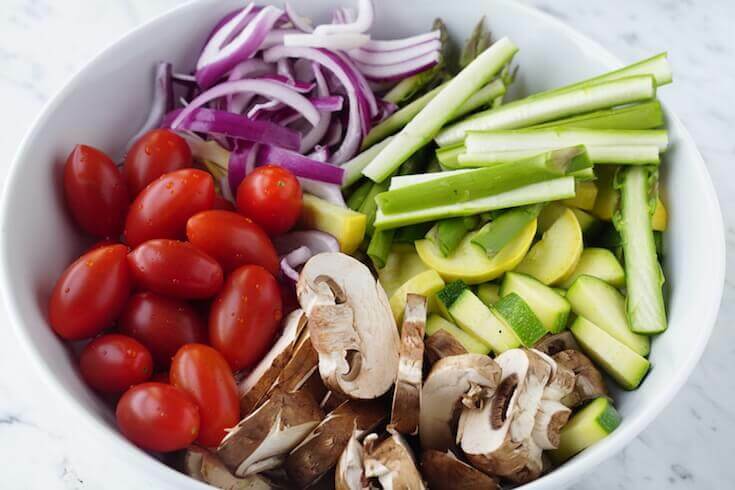 Slice the mushrooms, asparagus and onion. Remove the ends from the squash, slice in half lengthwise and then into half moons. Cut the cherry tomatoes in half. Start with the vegetables. Heat the butter & olive oil in a large skillet over medium-high heat. Add the mushrooms and onion and cook for 1 minute. For the sauce, add the minced garlic to the skillet, and cook until fragrant about 1 minute. Next, pour in the chicken broth and wine. Stir and scrape the bottom of the pan to loosen all the browned bits (that’s where all the flavor is!). Cook for 3 to 4 minutes, until reduced by about half. Stir in the Parmesan, and allow the cheese to melt. Add the cooked pasta and mix everything together well. If the sauce is too stiff, add a ladle of pasta water.Top with torn basil and Parmesan cheese. Thank you Mimi, I love this light easy pasta!! I appreciate you stopping by! Now this is my kind of dinner…Easy, Quick, and loaded with Veggies. Yum! Yummy and easy – such a great combination – thanks Stephanie! 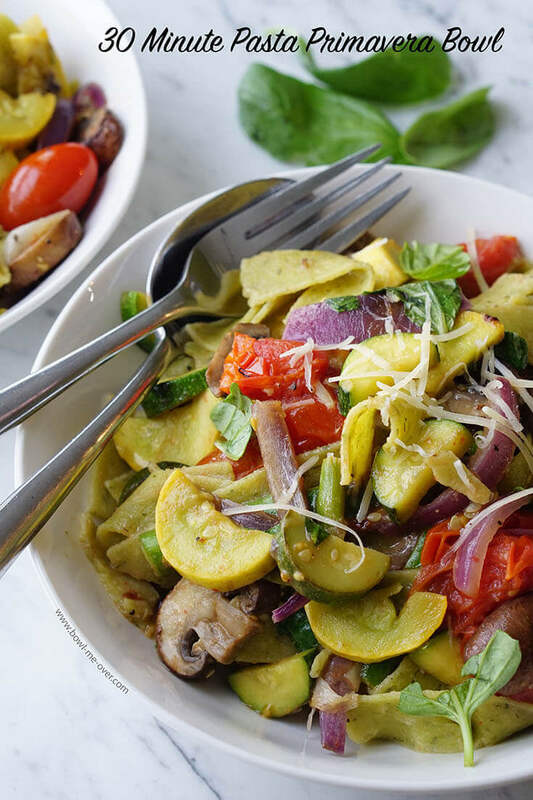 What a great bowl of veggies and pasta! I could totally go for this for dinner tonight! One order coming up Patty, extra veggies for you!!! 🙂 Thank you!!! That is a really healthy dish with lots of vegetables. I would have to try that without the wine. Easy enough Roxana – just substitute chicken broth – enjoy! I am seriously drooling over this dish!! This looks so amazing and yummy!!!!!!!!!! Thanks Deanna! I just love all the veggies in this dish!!! This looks so tasty and colorful. Yummy! Thank you Hannah! Pretty and tasty – the perfect combination!! !